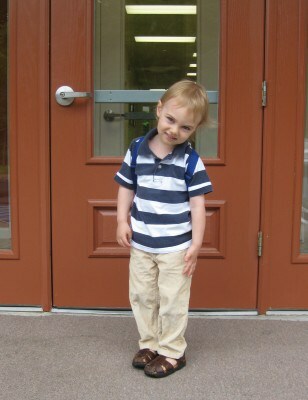 Landon is now two years and eight months old, and today was his first day in preschool! Since our neighbors moved away — and with it my wonderful babysitter — I had to enroll him in preschool to have time to do my work from home. I would have preferred to bring a babysitter into my home, but I know L would just be knocking at the office door the whole time. Thankfully, a new preschool has been build only minutes away from our home, so I inquired about their program months ago and they have a short program in the morning like I wanted. For now I enrolled him for 2 1/2 hours on three days during the week. So today was the big day. When we woke up, I traipsed into the kitchen to look at the clock, and it was 8:58 a.m. Landon is in preschool from 9 a.m. until 11:30 a.m.
Holy lateness!! Since we got back from Germany, L has been up at 7 a.m. every day, so I didn’t think we needed an alarm clock! So I panicked for a second and then pulled myself together. Yes, it was his first day, but I wasn’t going to ruin it by rushing him. 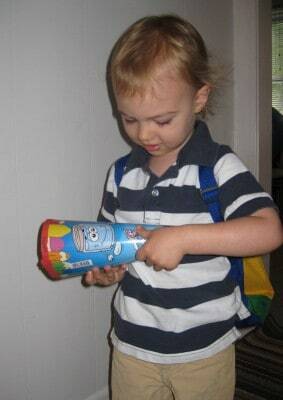 So I got him dressed and gave him his Schultüte, a paper cone filled with little goodies every German child gets on their first day of school. I had made a point of buying a little one on our Germany trip because I wanted him to have one. I still remember getting mine on my first day of school, and how it was almost as big as I was. I still have my Schultuete — it’s in my parent’s attic. Landon, of course, turned the Schultüte into an imaginary guitar right away and started jamming. I quickly packed a snack and put his backpack on him, threw on some clothes myself, and off we went. I had been worried about how I would react to this momentous occasion — I have become a softy and the tears fall way more often since becoming a mother, funny how that works — but I didn’t really have time to fall apart. We walked in and were greeted by the school’s director and then by L’s teacher. Miss Laura seems very nice, and there were only two other boys in the class for right now. I stayed for half an hour and Landon seemed fine, so I kind of snuck out. L did see me close the door and I waved at him, not knowing if I should tell him I would be back soon. But he waved at me and I took that as a sign that I could leave. In the car I started to worry if he would be okay but tried not to obsess about it. Instead of driving home like I had planned, I got a coffee and a bagel at a local Panera Bread shop and a treat for Don before we met at home to pick up L together. He was just fine and showed Daddy a few things he liked in the room. I was so relieved. My little boy is going to preschool, I can’t believe it! A few weeks ago, I started pointed out the preschool when we would drive by and tell L that he might go there soon and about playing with other kids and his teacher. I also told him about new toys he would be able to play with and that he has to share them nicely with the other children. He now pushes and hits sometimes, so I talked to him about not pushing or hitting other kids and that his teacher would tell him not to do so if he did. On our Germany trip, I bought a large “a year in the kindergarten” book. It has many illustrations of kids inside a preschool room and outside on the playground. I showed L the book several times and talked to him about what the kids in the pictures were doing. Before we left for Germany, I took L to the preschool to meet the director and see the whole facility. She showed us around although and L gravitated towards the lawn movers and got to play with them. Yesterday we went by to drop off the first check and L got to see the school again. So I slowly introduced the place to him and periodically talked about his first day of school with excitement, which made him exited. Although L is not very attached to any toy, I asked him if he wanted to put his Froggy in his backpack to go with him, and he said yes. I introduced Miss Laura to Landon and told him that he would be playing with her and the other kids for a little while. I told him that if he has to go potty that it is okay for him to tell her. I bought L some new Crayola no-mess crayons and paper as a special treat for after his first day and told him over and over how proud I was of him. Then I called my mother in Germany and told her about how well he had done and he got to talk to her a little bit and hear her praise. I hope all these little things help L to have a great preschool experience. I expect that L might have a tougher time on other days, but for his first day he did amazingly and I am a very proud Mama. After watching him interact today, I have a feeling he will like going to school. 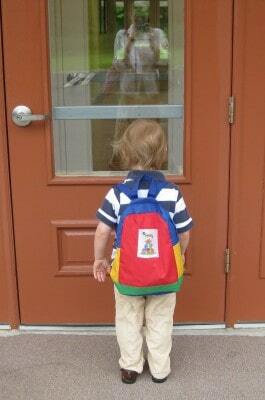 Ideally, I hope he can’t wait to go on his school days, but we’ll have to see — I’ll keep you posted. I love the idea of giving him a little gift or celebrating his first day. Maybe I’ll plan a special dinner for Peanut’s first day. How exciting! Sounds like a great way to prepare and handle what can be a stressful situation! Good work — great ideas! My German husband is obsessed with getting a Schultüte for our son for his first day of Kindergarten in the fall. I think we will have to make our ourselves in the end. Sounds like you were super prepared and it paid off … aside from the waking up of course! My little girls first day was not as well planned as it occurred the day after I came home from the hospital with her baby brother, and it was also our first month in our new house! Oh boy!! Can’t wait to hear how Landon does next week. I’m so happy to hear that Landon’s first day went so well! 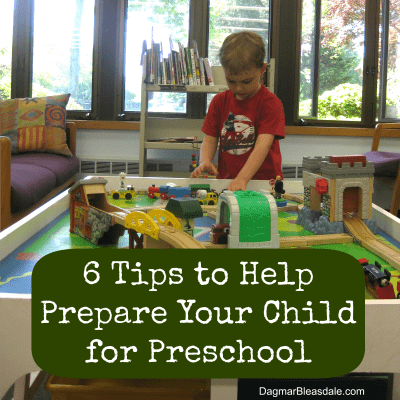 Those are great tips…I’ll keep those in mind in preparation of Abby’s first day of preschool in September. The paper cone…what an awesome idea and tradition!